Arthocin Review – Is This Product Safe To Use? Arthritis is a condition that needs to be taken seriously as it will progress and become more severe over time. The usage of joint health supplements may play a vital role in fighting the symptoms of this disease, but only if you choose the right product. In this review, we will try to figure out whether Arthocin can be the right choice for your needs. Arthocin is a dietary supplement based on natural herbal ingredients and designed to help those that are experiencing all sorts of distress caused by arthritis and poor joint health. The product aims to help in lubricating your joints and improving their flexibility, which may also assist in making you feel comfortable while moving around. The product aims to boost joint health by supporting cartilage formation in a healthy way, such as by stimulating the production of hyaluronic acid which plays a part in joint lubricating. You can purchase the supplement in the form of capsules that contain several natural active ingredients. What is the Company Behind Arthocin? The company that manufactures Arthocin is Terry Naturally and it was named after the founder Terry Lemerond. He has over four decades of experience, which enabled him to develop numerous formulations aiming to improve the consumer’s health in a natural way. The company has a wide selection of products, including those that focus on weight management, promote digestion, immunity, anti-aging, and overall health. Arthocin is orally ingested on a daily basis and its working process focuses on the long-term benefits to your joint health. The formula contains several natural ingredients that have anti-inflammatory properties and boost the body’s natural inflammatory response. Aside from that, the product aims to boost the structure of cartilage, which may affect increased mobility and comfort you feel in joints. Cartilage formation may also be essential when it comes to dealing with symptoms of arthritis and reducing or delaying them. What are the Ingredients Used in Arthocin? What are the Pros of Arthocin? What are the Cons of Arthocin? The instructions suggest that you should consume one or two capsules of the product two times per day, but it does not clearly indicate when is the optimal time to take the supplement. 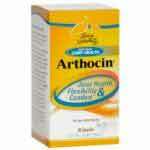 The regular price for Arthocin on the official website of the manufacturer is $46.95 for a monthly supply. However, according to the information revealed over there, if you subscribe to the auto-shipping program, you are entitled to a 5% discount. Here is the deal – if you want to check the feedback from existing users, you need to make sure to read both positive and negative reviews. There are users that commended the effectiveness of Arthocin, especially when it comes to pain related to arthritis. Although they claim the product delivered results, there are others that emphasize they noticed little or no improvement at all. These users emphasize that they expected a lot more and they are sorry that the product didn’t deliver. Arthocin comes from a manufacturer that has developed numerous different formulations and this one may help to improve your general joint health in the long run. However, the overall impression is that it could have used more ingredients, which is supported by some reviews emphasizing that the product is ineffective. At the end of the day, Arthocin may help you to experience pain relief and reduce arthritis symptoms, but you shouldn’t expect overnight success or revolutionary results. You may consider some other supplements currently available on the market if you think a different formulation would be a better fit for you. After all, the only way to know for sure is by reviewing all alternatives at your disposal.